Will a Tea Party Favorite Become the Next Black U.S. Senator? He wears boots and a bow tie and calls global warming a "fantasy." He worked for George W. Bush's White House and sits on he Texas Railroad Commission, which regulates energy in the second biggest state. He's also African American, and he's announced that he's running for the U.S. Senate to replace Kay Bailey Hutchison. He faces an uphill battle against Lt. Gov. David Dewhurst, but his philosophy fits in well with the Tea Partiers. Sen Jim DeMint, who has made a career of endorsing Tea Party candidates, has called him an "outstanding conservative leader." If he wins, he'd be the only black member of the U.S. Senate. We look forward to hearing Williams expound his views, but get used to it, folks. 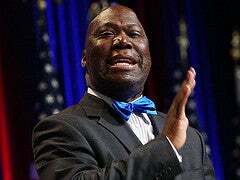 The Tea Parties are likely to back black candidates to ward off the stench of racism at their foundation. There will be blacks in national office whose views are not shared by the majority of African Americans. Read more about Williams at the Daily Beast.